The 5-door GMC Acadia is one of the best-looking crossover SUVs to debut recently.The Acadia is well-proportioned overall, with a non-fussy style and just the right size of grille and headlights at the front. The GMC Acadia is a midsize crossover SUV that has three rows of seats, a good driver seat view of the road, generous cargo room, commendable road manners and pleasing V6 power. The Acadia’s fuel economy rating was 18 miles per gallon in city driving and 26 mpg on the highway. Three trim levels are offered: SLE, SLT1, and SLT2. All are available in front- or all-wheel-drive configurations. The only Acadia engine is a 275-horsepower 3.6-liter V6 with variable valve timing with 6-speed, automatic transmission that gets power to the wheels quickly, particularly in the low gears. Maximum torque rating is 251 lb-ft at 3200, and some 90 percent of the peak torque can be had between 1500 rpm and 5800 rpm. The standard features includes air conditioning with rear controls, power outside mirrors, cruise control, tilt/telescoping steering wheel, power windows, programmable door locks with remote keyless entry, four-way manually adjustable driver’s seat with lumbar adjustment, AM/FM/CD/MP3 audio with XM Satellite Radio, automatic headlamps, daytime running lights, rear spoiler, roof rails and P255/65R18 tires on painted aluminum wheels. GMC Acadia comes loaded with safety equipment, including side-curtain airbags, side-impact airbags for torso protection and StabiliTrak electronic stability control and other active safety features that help the driver avoid accidents. 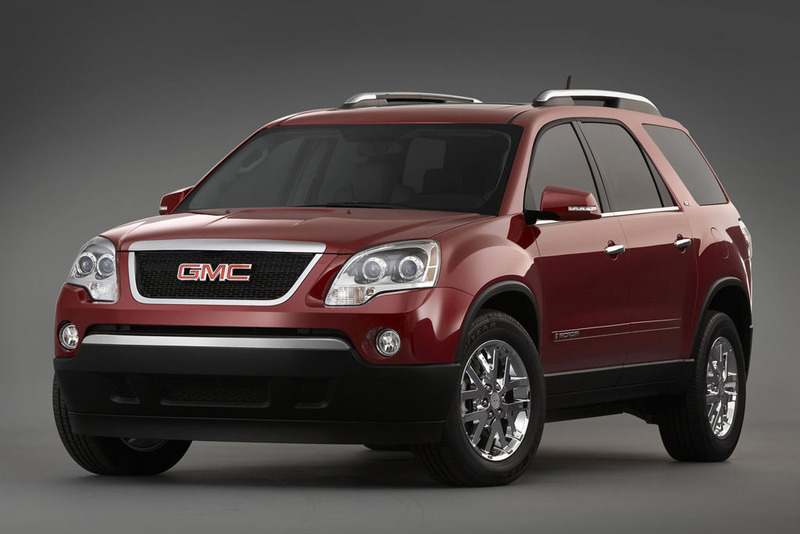 The GMC Acadia is one of the roomiest crossover utility vehicles in its class, with seating for up to eight passengers. The second-row seats slide 4 inches fore and aft and easily flip up and out of the way for access to the third-row seats. Behind the third row, there is a respectable amount of luggage room.